Four billion people around the world are effectively invisible, because they do not have an address. Inadequate addressing means that 75% of the global population cannot clearly communicate their home – or other – location. This makes it difficult for emergency services to respond to crime, attend accident scenes, and provide aid. Commercial deliveries can be hampered and citizens find it difficult to exercise their rights without an official place of residence. what3words addresses the problem of imperfect addresses by introducing an alternative system, seeking to save especially developing countries millions of pounds in wasted shipping costs, and potentially save lives in humanitarian situations. what3words assigns every 3mx3m location on Earth a fixed and unique three-word address. Easier to communicate than GPS coordinates, and exact enough to identify any spot, this simple addressing system is powered by an algorithm that only takes up 10MB of space. An API is also available for businesses, which means comprehensive access to residential, commercial and organisational locations around the world. what3words is available in most of the official UN languages, plus others. British entrepreneur Chris Sheldrick wants the system to become a global geographic standard, and has designed the three words assigned to a location to be memorable and human friendly. The system works well. Netherlands business, In2Case develops tools to control mosquito-borne diseases, and uses what3words to easily define the location of its traps. Indian organisation, Pollinate Energy is tackling energy poverty in informal settlements and assigns each of its customers a what3words address to identify their whereabouts. You can have a go too – just go to the website or download the what3words app on iPhone or Android, and find out where your home or office is. 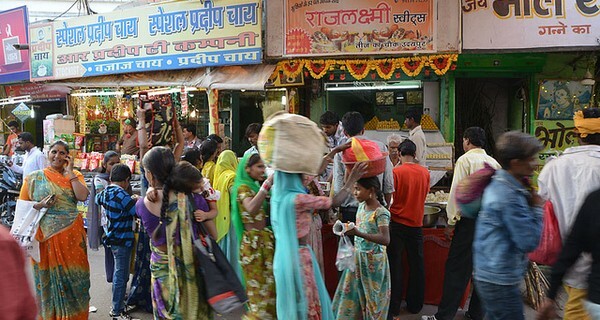 Image 'Busy shopping street, Udaipur' courtesy of Oliver Laumann.